This project is all about changing the non-standard lamp holders in your Aerogarden for ordinary ones, so that you can use more readily available compact fluorescent lamps in it. I guess that the reason the Aerogardens come with a weird specialist base is largely to stop people putting hot tungsten lamps in and setting fire to their units! But the down side of this is that here in the UK it's been very hard to get hold of replacement lamps, and the ones they supply are less than reliable and VERY expensive! This project involves mains voltage, water and dangerously fresh lettuce. You tackle this project entirely at your own risk. 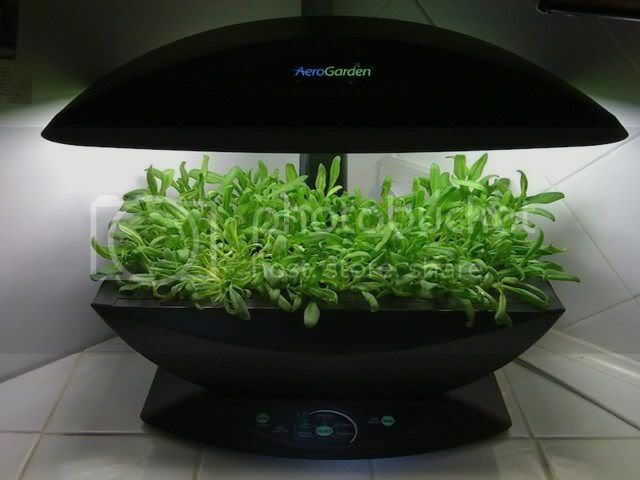 This is an Aerogarden. It's a self contained hydroponic unit that can be used to grow vegetables, herbs and quite probably naughty plants indoors. You plant your seeds in little plug-in pods, fill the unit with water, pop in some nutrient tablets and select the type of plant you're growing. The unit then cycles the high output compact fluorescent lamps in the canopy and the water pump in the base to grow your crop. It works well and is actually a very attractive unit. OK. Let's start by whipping the top off it. 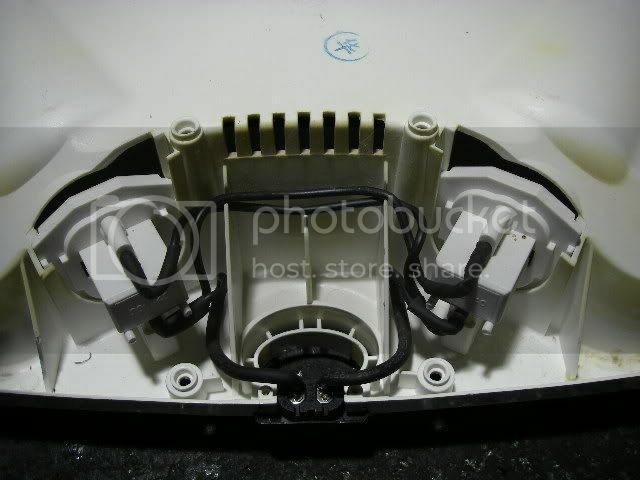 To remove the lighting canopy you unplug a small two pin plug from it and press a catch at the back of the lid that releases it from the support. 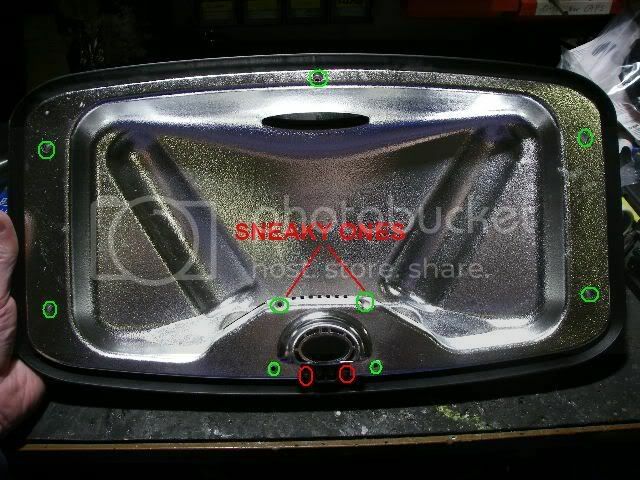 Now you remove the 9 screws marked in green, noting the sneaky recessed ones as shown. 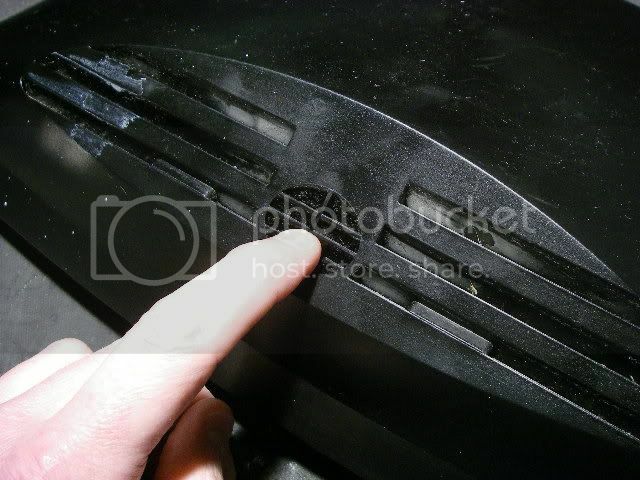 There are also two screws that hold the connector on, but you don't need to take these out right now. I think there are a few different types of canopy in use, so if yours doesn't look like this one, then you'll have to decide if it can be adapted in the same way. The existing lamp holders just slide into two slots and are connected in parallel to the connector. At this point it's important to note that this is mains voltage, there's no earth connection, the connector is not polarised and the reflector is made of metallised plastic with a clear coating. It's important to note a couple of safety details. The reflector should be regarded as being metal, since the chrome coating on the plastic is conductive. The use of Edison Screw lampholders normally requires that the middle terminal is live and the outer thread is neutral. This can't be guaranteed due to the non-polarised mains connector, so extra care must be taken inserting lamps if you use an ES holder. Of course, a warning like this is a bit of a moot point when you can poke your entire finger into the thing! 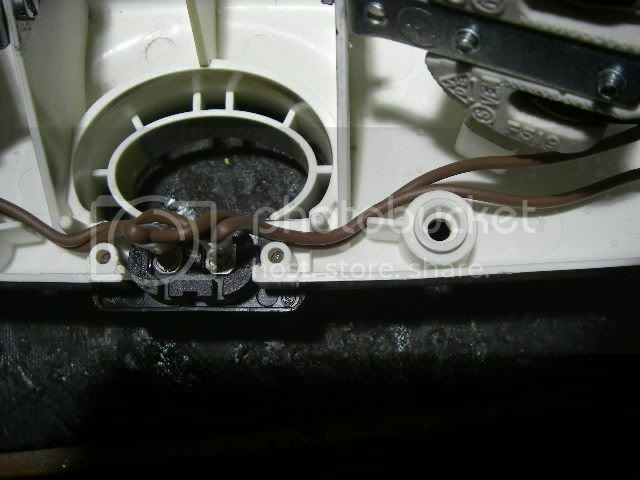 If you've not already removed the two screws that hold the mains connector in place, then do so now and the whole wiring assembly can then be lifted out. There are two supports behind the lamp holder positions that will get in the way of most alternative holders, so they need to be removed. I used a Dremel to cut them down in size. This project came about because a friend who has a couple of Aerogardens was having trouble sourcing the lamps for them. 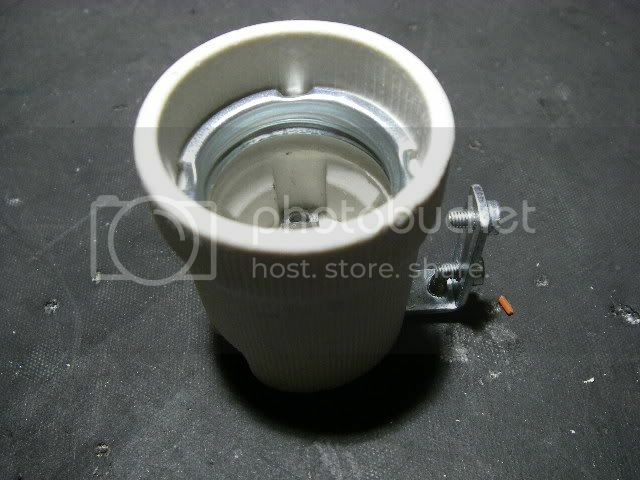 He bought some ceramic Edison Screw E27 lamp holders on ebay and a couple of high power compact fluorescent lamps too. I suggested that we could use traditional UK bayonet cap lamp holders, but he insisted on the Edison ones because he felt that they would hold the lamp more firmly. He's right. The lamps would probably droop or wobble in sideways mounted BC holders. 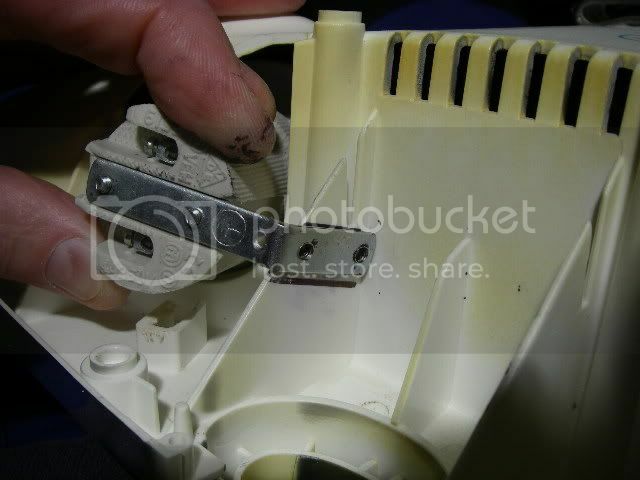 To find similar holders, try searching ebay for "ceramic E27 bracket". Alternatively, source what you can and adapt accordingly. Screw your chosen lamp into the holder and experiment with positioning to allow easy changing of the lamp. 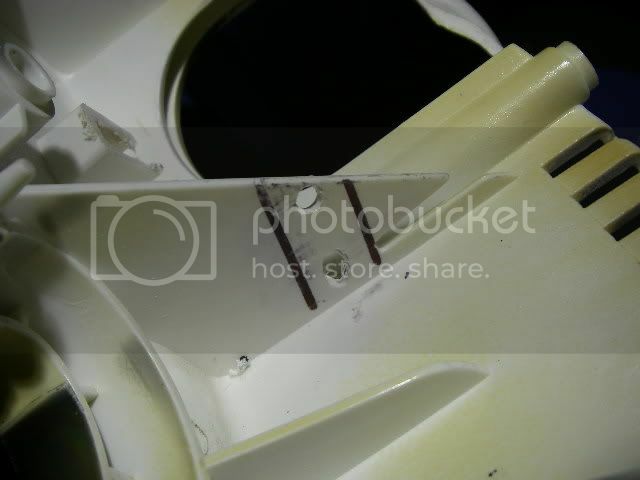 In my case I found that with a little bending the existing brackets that came on the holders could be attached to a convenient plastic fin. I'd heard that some people glue new holders into their canopies, and when I was fitting these holders they were such a close fit to the existing cutouts in the plastic that I think that glue is actually a very viable way to go. If you choose that route then use a decent glue suited for high temperature use and be generous with it. I don't know how hot the canopy gets in use, so I'm not sure if hot melt glue would work, but it could certainly be used to hold the holders in place while another glue like a two-part resin or epoxy putty was applied. Although i was going to use the bracket on the other side of the fin, I put it over the other side to mark the alignment and hole positions. Access is a bit tricky and requires drilling at an angle. 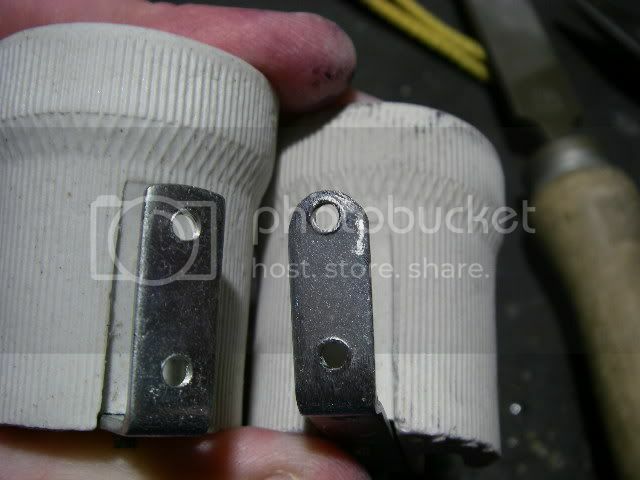 I also elongated the bottom holes to make alignment of the screws easier. 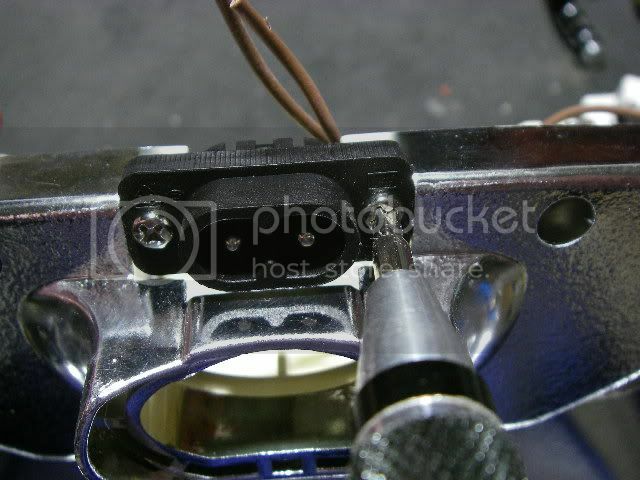 Space for the bracket was quite tight, so I filed the ends down closer to the threaded hole. 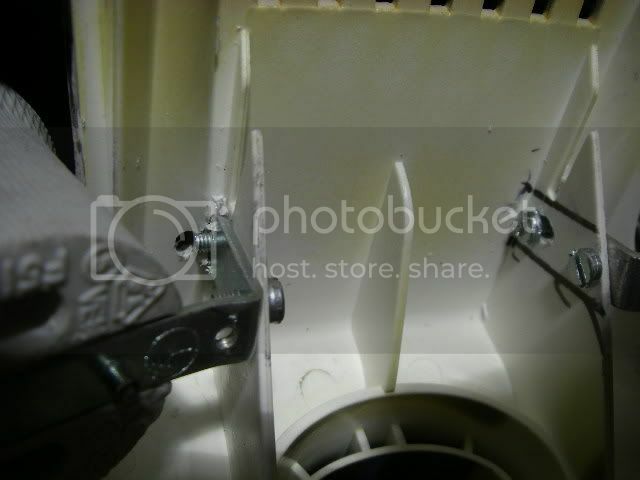 I also had to drill a couple of holes in the vertical support pillars to allow the fixing screws to protrude into them. Once the holders are in place it's time to wire them. I used new cable stripped from a bit of flex. I made all the wires brown, since there's no point differentiating between live and neutral if the connector isn't polarised. 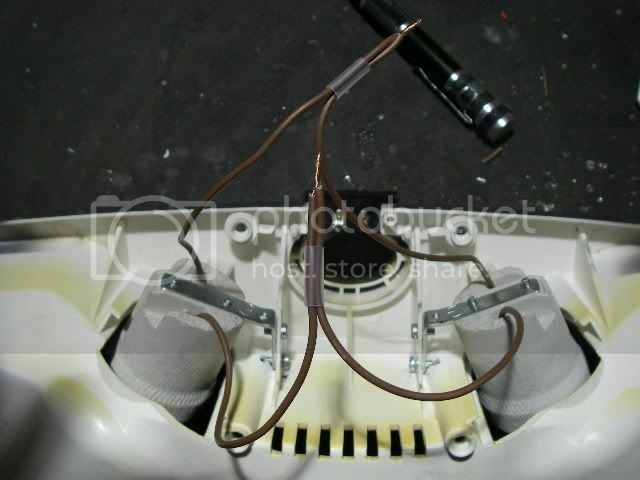 Strip the wires enough that the ends can be twisted and doubled over if necessary to get a decent grip in the lamp holders connectors. 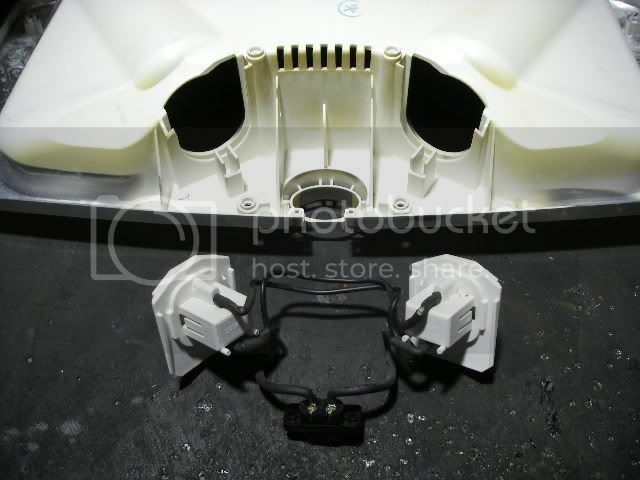 Make sure that there are no loose strands poking out anywhere near the bracket, and also make sure that there isn't excessive wire protruding into the holder, as if there is too much it can short against the base of the lamp. Desolder the existing wires from the mains connector if possible. I found that the original wires had been threaded through a hole and folded back before being soldered, which made them hard to remove. Alternatively just cut them flush. Now screw the power connector back into position if it's not still screwed in. Note that there are no wires connected to it at this point. 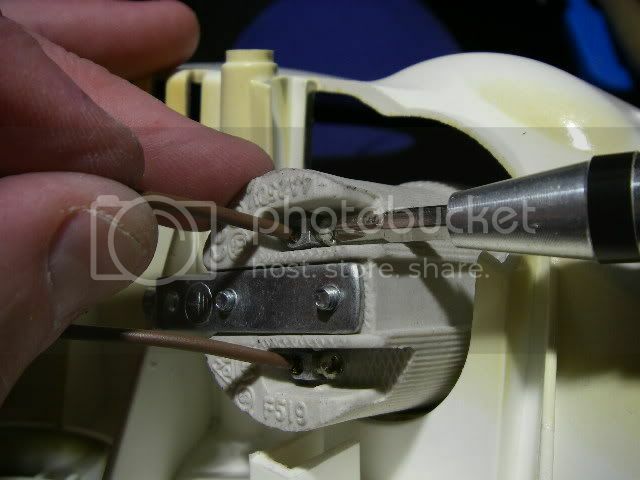 Trim the wires on the lamp holders to an equal length that allows for easy routing as shown below. 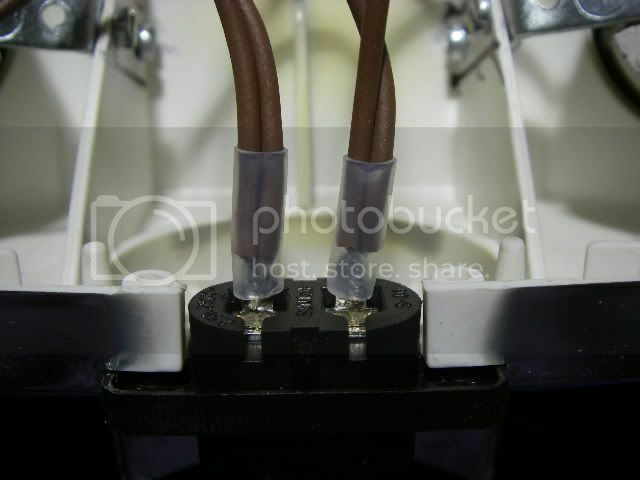 Take one wire from each holder and strip and twist them together, then slide a bit of heatshrink sleeve over them. Then do the same with the remaining pair. Solder each pair to a pin of the mains connector, making sure there are no loose strands of wire poking out. Then slide the heatshrink sleeving down over the connections and carefully apply heat to shrink it on. If you don't have suitable sleeving you may be able to use a bit of the stuff that was on the original holders. 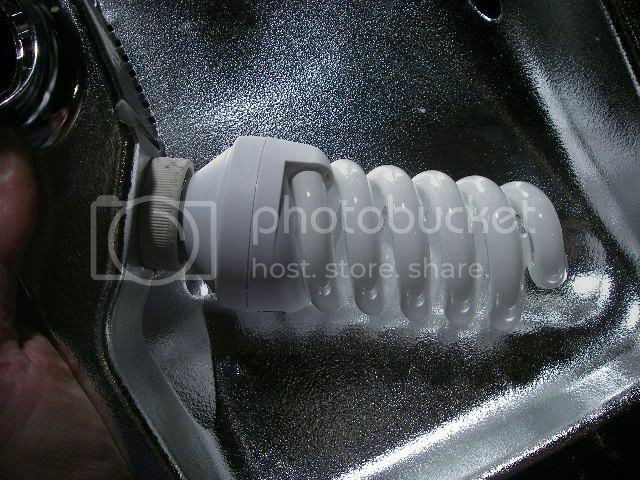 the sleeve is just an extra precaution to cover up the connections. Route the wires carefully avoiding the area that the canopy support slides through, and also making sure they are not anywhere that a screw might cut into them when the canopy is reassembled. Now carefully reseat the reflector into the hood making sure it sits into the screw pillars properly, then put the screws back in gently. 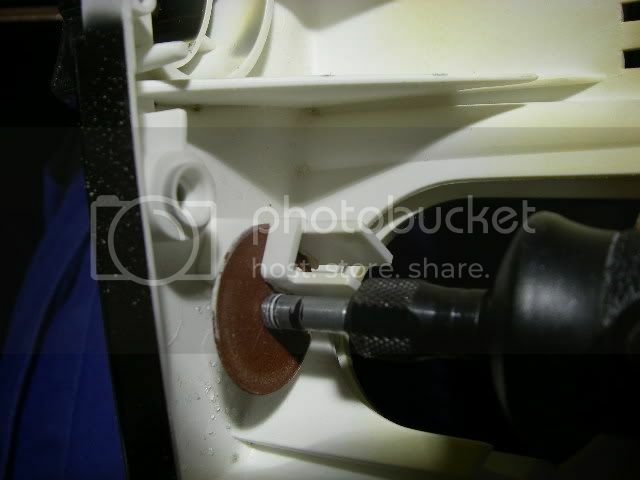 Over tightening the screws can easily crack the plastic pillars they go into. 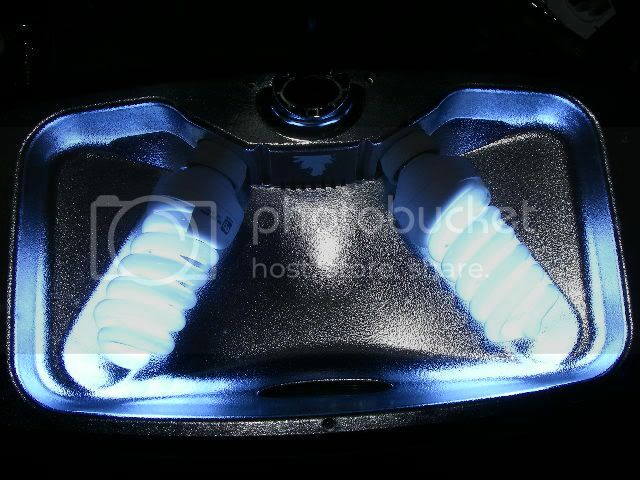 Once it's screwed back together you can then insert the new compact fluorescent lamps, power it up and not have to worry about expensive, hard to find lamps any more.